I first heard of Anita Grant only a few weeks ago when I came across a Brown Beauty Talk with Anita Grant on Twitter one Sunday. Following the talk there was a competition on Instagram to win a £30 voucher to spend at anitagrant.com and guess what? I won! This was a new brand to me so before entering the competition I checked the website to see what Anita Grant did and I was pretty impressed. It is a family run brand which makes handmade skincare and haircare using natural ingredients. I like brands (for any product) where the owner puts something of themselves into it because it makes the products feel more special. It also makes mineral make-up which is supposed to be good for the skin. The best part for me is that as far as I could see, all the products come in sample sizes which are cheaper than the full-size versions. You can try them out for a fraction of the price before making a full commitment. As this is an online store, this is a very important option. I won the competition in the middle of my spending ban so I have only just been able to spend the voucher. I had to make do with a Pinterest wishlist in the meantime. I wanted all 36 of the eyeshadows but that would have blown the budget. One purpose of the spending ban was to get me to focus on my beauty expenditure! I wanted to sample a range of products and the voucher was the perfect opportunity to do this. First I wanted to try a skincare or haircare product. Ideally I would have wanted to try the Curl Conditioning Clay Hair Wash but this is for afro hair so it is not suitable for me. 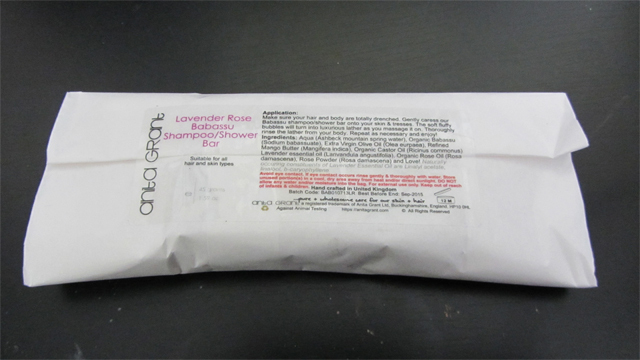 I went for a sample of the Lavender Rose Babassu Shampoo/Shower Bar to use as a shower bar. It smells heavenly! 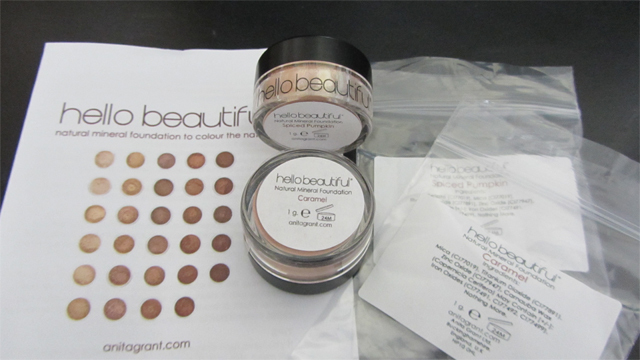 Then I chose two foundation samples – Spiced Pumpkin and Caramel. It took me two attempts and a couple of hours to figure out which shades to pick! There is a guide to picking foundation but I couldn’t work out whether my undertone was olive, neutral or warm and whether my shade was medium, tan or rich! I’ve never colour matched my own foundation before and I’ve never bought foundation online without having previously tried it in a store. I settled on warm tan. Unfortunately for me, after all the drama I discovered that there is no recommended shade for warm tan skin. I decided to take a guess and try Caramel which is for rich olive skin and Spiced Pumpkin which is for tan olive skin. If I get it wrong I’ll just order a couple more samples. 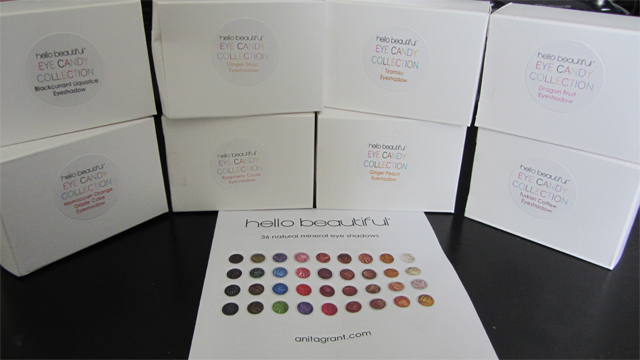 Finally I had the agonising task of choosing some eyeshadow colours. When they arrived I realised I picked a bunch of neutral colours so I need to add more brights to my collection if I like these. I’ve already got my eyes on Honey Dew Melon, a vivid green and Mauve Parfait, a berry pink. 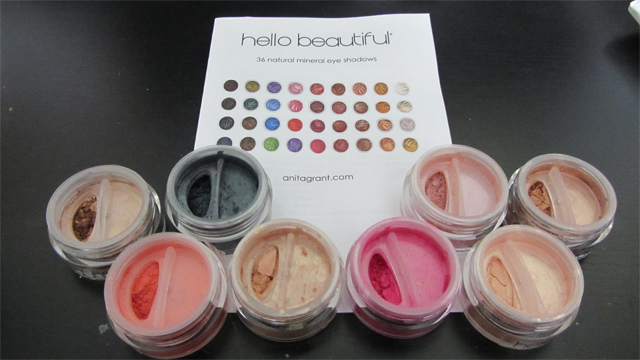 All of the eyeshadows have tasty names which makes me want them all. I don’t normally go for mineral eyeshadow because I can make quite a mess when applying make-up. I now need to address that! The colours are much paler than on the website according to my screen settings. It actually means they are more wearable! Everything came securely packaged and wrapped in tissue paper, mini cardboard boxes and tiny plastic wallets. It felt good to be able to throw the packaging into the paper recycling bin rather than the landfill bin. 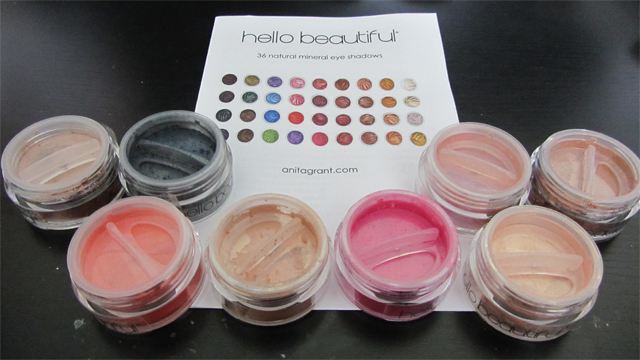 Another touch I like about the packaging is the “hello beautiful” stickers on the pots – so cute! As an added bonus, the eyeshadows came with a guide to understanding my eye shape so I can get the best out of my new eye make-up and the foundations came with a guide covering application and other tips. I am impressed so far. The service has been great, which is very important to me, and I’m sure I’m going to love the products. I’ll post when I have tried a few of them out.